The Council of the Great Lakes Region (CGLR) and its partners have released a report on Ontario’s electricity system – titled ‘Ontario’s Long-Term Energy Plan: Understanding Carbon Emissions, the Role of Nuclear and Electricity Trade with Quebec’ – which finds nuclear energy is a critical source of reliable electricity to maintain system reliability, achieve climate change targets and enabling electricity trade with Quebec. In the fourth quarter of 2016, Ontario’s Ministry of Energy reviewed its Long-Term Energy Plan through a transparent public consultation process. The Ministry is expected to release its updated LTEP early in 2017. Some of the focus areas of the LTEP review are the province’s Climate Change Action Plan (CCAP) objectives, lowering the cost of electricity for homeowners and businesses, meeting short- and long-term emission targets, and preparing for Ontario’s future by securing carbon-free energy sources, including baseload nuclear, as well as renewables. The future electrification of the transportation sector will also be considered in the LTEP, because it is important the energy used to charge electric vehicles comes from non-carbon emitting sources, such as nuclear and renewables. These lofty goals cannot be met without the continued support of the current vision for nuclear power in Ontario, which will see the life of the Bruce Power site extended through 2064, the refurbishment of Ontario Power Generation’s Darlington nuclear station, and the safe operation of OPG’s Pickering plant through 2024. These are the necessary and most affordable first steps in a shift towards an electricity system that will be increasingly dependent on nuclear generation and increased nuclear capacity as a source of safe, reliable and affordable power for decades to come. Any move away from nuclear will make it more difficult for the province to reach its emission targets, as outlined in the CCAP, because renewables require carbon-intensive backups due to their unreliability, while nuclear generates vast amounts of power 24 hours a day, 365 days a year and supports tens of thousands of high skilled Ontario jobs. Also, an electricity system, with a baseload of low-cost nuclear energy, can save Ontario an estimated $6.9 billion per year off the cost of achieving the emission targets. Low-cost electricity can also save up to $1 billion annually in externally purchased allowances, accelerating the benefit of the invested proceeds to achieve emission reductions. The LTEP must identify the lowest-cost electricity solution for Ontario, while ensuring the integrated costs of generation, transmission and distribution are reflected in its decision. While interprovincial imports and exports will play a role in Ontario’s electricity system, it’s important to realize Quebec does not have a surplus for export during its frigid winters, and will have little energy to outsource, post-2025. Though the provinces work together, it’s important Ontario continue to develop its home-grown solution, which centres around nuclear as the provider of its safe, reliable and low-cost baseload power. The firm Strategic Policy Economics (‘Strapolec Inc’) performed two in-depth studies (‘Renewables and Ontario/Quebec Transmission System Interties,’ June 2016, and ‘Ontario’s Emissions and the Ontario Long-Term Energy Plan,’ December 2016), which examined future electricity demand in Ontario, as well as the options for meeting this demand in a cost-effective and environmentally prudent manner. 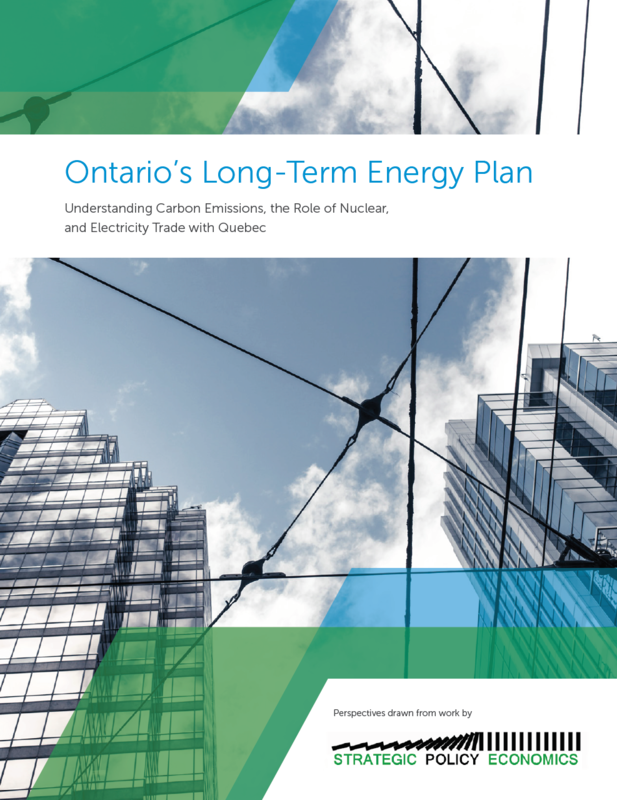 The studies conclude the LTEP process should identify nuclear energy as an optimal source of emissions-free power that will enable Ontario’s electricity system to adapt to the requirements of a reduced carbon economy. The ongoing Life-Extension Program at Bruce Power and refurbishments at Darlington are necessary to Ontario maintaining its reliable and low-cost baseload supply of electricity, while also helping to achieve Climate Change Action Plan targets. Nuclear, which annually provides 60 per cent of Ontario’s electricity, is all of these – it’s carbon-free, reliable and safe electricity, which costs consumers 30 per cent less than the average residential price of power. And it’s of utmost importance to Ontario’s energy future.